The beauty of nature is unrepeatable, but this Waterfall necklace comes close to the magnificence of a natural Waterfall. Your dog deserves to feel comfortable and relaxed! Why not give them daydreams of a tropical vacation, with the comfort of never leaving their home or owner�s side? 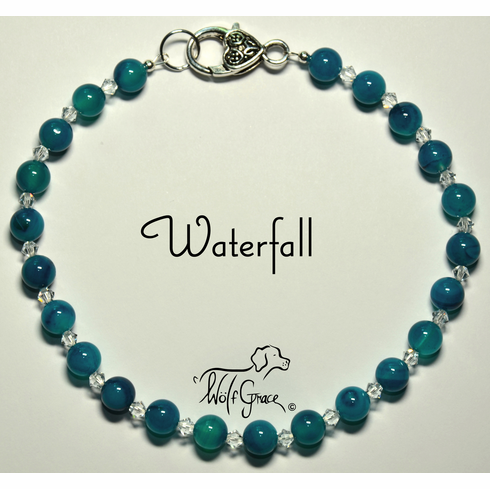 Now your dog can have all the beauty of a cascading waterfall around their neck without having to lift a paw to visit a distant land. Like water itself, the 8mm round Denim Blue Agate beads resemble the raw natural hue of water at a tropical landscape setting. To simulate the whitecaps of water, we added 4mm bicone Crystal Satin Swarovski beads in-between each and every 8mm round Denim Blue Agate bead. We didn�t want your beads to float away, so as all of our necklaces, the beads are strung on Sterling Silver jewelry-grade wire. Notice on each end of the necklace, how the Sterling Silver crimp covers reinforce and conceal the Sterling Silver crimps, which hold the beads securely in place.